Some people dream of spending their summer holiday reading novels away from the madding crowd with the faint sound of waves washing against the beach. For Helen Patrin, the summer break will involve sitting on a cushion among hundreds of thousands of other people in a dusty field in the east Indian town of Bodhgaya. Patrin, 31, left her Sydney home last week to travel to the Indian state of Bihar to listen to 10 days of Buddhist teachings by the Dalai Lama. Having the Dalai Lama teach on this particular text, called Kalachakra, is such a rare occasion that the Tibetan monasteries of India and Nepal have closed down and tens of thousands of monks and nuns have flocked to the town. There they have been joined by visitors from around the world - which has swelled Bodhgaya from its resident population of 22,000 to something in excess of 200,000. The influx is likely to cause problems with electricity, water and food supply - although temporary tent restaurants will provide for many. For the duration of Patrin's stay, home is a tent pitched in the grounds of a small monastery. Food consists of biscuits, miso soup and other dry goods she will have bought along the way. "Conditions are going to be really tough so I want to get there a bit earlier to make it a bit easier on myself," says Patrin, who works as an attendant for the resident teacher at Sydney's Vajrayana Buddhist centre. This is her third visit to India and the place considered by Buddhists to be holy. 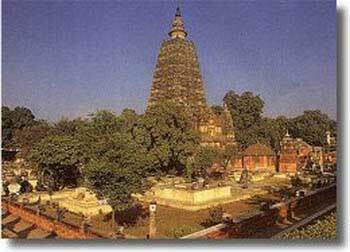 It was at Bodhgaya 2500 years ago that the Buddha sat underneath the Bodhi tree until he gained enlightenment. "Every year I've saved up as hard as I can and worked as hard as I can," says Patrin. "It's a kind of a holiday but more of a spiritual holiday."